Capital markets firms are under pressure from all sides. Regulators want more transparency, clients and shareholders want greater margins at reduced cost, and new entrants are eating into already sparse liquidity, making generating those margins even harder. For many firms, finding new sources of liquidity—either through new venues, instruments or new trading strategies—is critical to commercial success. Once connected to these sources, they need to be able to trade quickly and reliably. High frequency competitors are already trading at microsecond intervals. For non-HFT firms to make money, they need to be able to execute trades exactly when needed: a delay of even a few milliseconds could impact execution quality. Rather than looking only to new venues as the principal source of new revenues, firms should consider the returns that can be achieved by better instrumenting, and in turn optimizing incumbent trading architectures in order to improve revenues and profitability on existing venues. Moreover, in doing so, they will achieve a far better ROI against a backdrop of heavily constrained and diminishing budgets. Extranets— connecting financial services providers’ trading infrastructure to market makers, exchanges, and other wide area network locations—are particularly susceptible to packet loss and latency performance issues. As a result, assuring extranet performance delivers a significant trading advantage, directly impacting the bottom line. While many aspects of network reliability are covered by service level agreements with extranet service providers, traditional network monitoring tools often lack granularity in reporting, covering broad, averaged metrics over reporting intervals—from seconds to minutes, or even daily—that are eons in time-sensitive trading. Measurement precision is often insufficient: millisecond latency metrics in a sub-microsecond world. 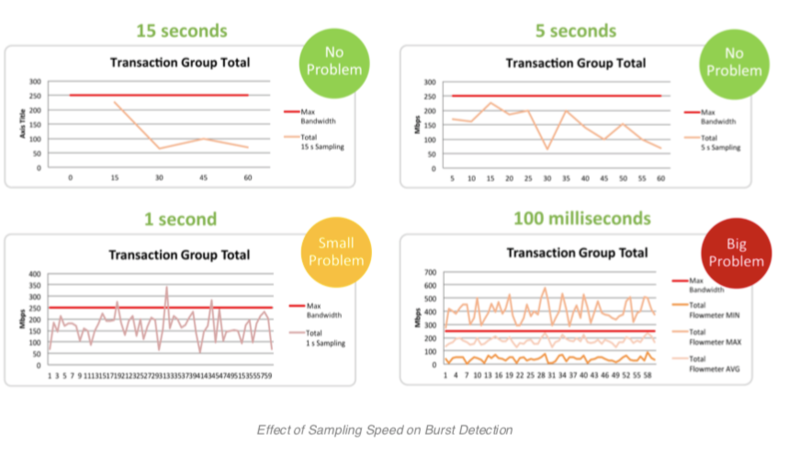 Without having access to highly-precise, granular, real-time, sub-second performance monitoring, it’s impossible to accurately detect latency variations, trade flow gaps or microbursts. Latency spikes and packet loss from bursts of network traffic can disrupt hundreds of trades. Yet, most existing monitoring tools lack submicrosecond sampling rates and the measurement precision required to detect these issues. Precise and accurate low latency monitoring requires highly precise and accurate time stamping. Any slight inconsistencies in time measurement can distort metrics, particularly in situations where traffic is being measured in disparate geographic locations. As critical as accurate timing is for active latency measurements, emerging regulatory regimes such as MIFID-II underline its importance. Precise trade packet timestamping and capture is required for reporting and analysis, and compliance becomes impossible without granular, precise, distributed network-embedded real-time monitoring. Accedian assures the network performance of some of the world’s largest financial service providers including global deployments with Thomson Reuters and Colt Capital Markets. Accedian’s highly scalable solutions monitor networks spanning over 100 countries. Accedian’s solutions are fully compliant with MiFID II and Dodd Frank regulations. FlowBROKER™ packet brokering features include time-stamping, packet slicing, efficient bundling, and lossless streaming to analysis platforms.